Yuya Wakamatsu couldn’t believe what he was hearing when he was offered the opportunity to welcome Demetrious Johnson, the former UFC flyweight champion and one of the best fighters ever, to the ONE Championship cage. Wakamatsu has competed just once for ONE Championship so far and came up short in his debut effort, losing a decision to Danny Kingad. As such, he didn’t expect to receive this kind of offer so soon. Nonetheless, this was an opportunity he’d been dreaming of for years, and one he simply couldn’t turn down. The Kagoshima, Japan native is now set to collide with Johnson at ONE: A New Era on March 31 in Tokyo. “I’ve always believed that ONE is the best promotion in the world, and then Demetrious Johnson joined the roster, and in my mind, I have always thought that it would be an honor and great opportunity to fight him,” Wakamatsu told BJPENN.com, explaining what went through his head when the bout was first offered. “I didn’t know ONE would offer me a fight like this so soon due to my previous loss. When I heard that they offered me the fight, I was really shocked, but very honored at the same time. “I really thought deeply about it and I was nervous,” he added. “But I wanted to fight soon and I knew a chance like this might never come again. Once he’d accepted the bout offer, the fighter they call “Little Piranha” — named after his trainer and manager, Japanese MMA legend Ryo Chonan — jumped into his preparations for the task a hand. He’s had big fights before, most notably his 2018 Pancrase title fight with Senzo Ikeda and his ONE Championship debut opposite Kingad, but he’s never fought an opponent like Johnson. He hasn’t quite figured out best to approach this challenge yet, but plans to lean heavily on his ridiculous firepower — the same firepower that has helped him score finishes in nine of his 10 pro victories. “I don’t have a specific fight plan yet but I am preparing to bring out the best in me and showcase all the power I have on the day of fight,” he said. 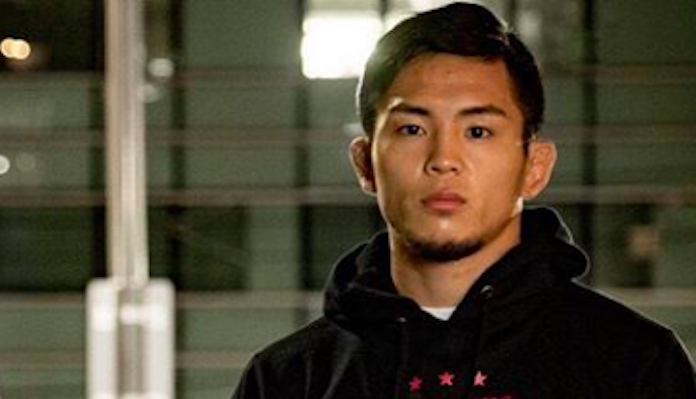 Of cousse, against a fighter like Demetrious Johnson, Yuya Wakamatsu understands that he must be flawless. He’s watched many of the former UFC champion’s fights, and knows how dangerous he is. In the lead-up to this massive challenge, there is one fight that Wakamatsu will be studying extensively, the fight that ended Johnson’s title reign: an August split decision loss to Henry Cejudo. The Japanese fighter says this fight proved to him that, despite previous perceptions, Johnson can in fact be beaten. He is not invincible. Given Johnson’s previous accolades, some fans have speculated that he might end up taking Wakamatsu lightly. Yet Wakamatsu highly doubts this will be the case. If Wakamatsu is able to do the unthinkable and defeat Johnson in Tokyo, he’ll advance to the second round of the ONE Championship Flyweight Grand Prix and take a giant step in the direction of his ultimate goal: proving that he’s the best in the world. However the fight goes down, Wakamatsu wants the world to know that he should not be counted out. Wakamatsu looks at this fight with Johnson the opportunity of a lifetime, and he does not intend to waste it.